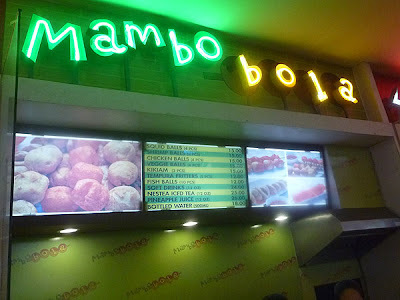 Oh don't flatter me, you just want some fish balls. 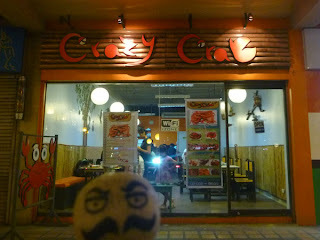 We met Nori when he sent me a message on Couchsurfing asking if I had time to show him around Cebu. I immediately said Yes. It was a mix of excitement and fear. This was my first ever hosting a couchsurfer for dinner. We met at IT park and, customary to Japanese, he was there 10 minutes before our meeting time. 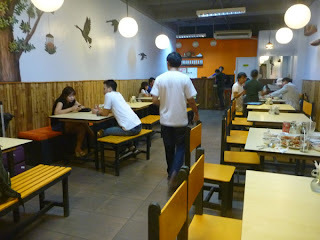 Since I always want foreigners to taste the Cebuano cuisine, I brought Nori to Chikaan sa Cebu. It was a fun-filled meeting. We talked about ideas, movies and other interesting stuff. 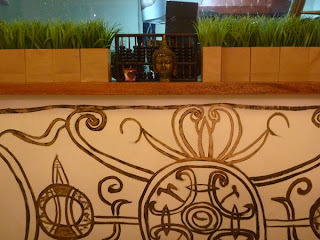 We met again, 2 days before his last stay in Cebu, and ate at Mae Krua. We continued our night with a little drinking and more laughs. He liked our beer here, especially San Mig Light. We ended the night dropping the already red Nori at his boardinghouse. He was smiling and thanking us as we parted ways. What I found about talking with a foreigner is that even if the discussion goes a long way (and sometimes getting lost in translation), in the end, it always wraps up to a good hearty laugh. 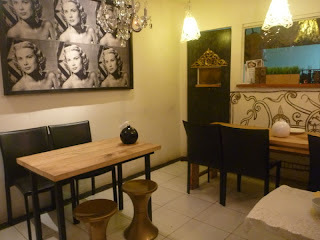 This interview was conducted at Mae Krua. We stuck to the topic of travel - I didn't want my new friend to be answering serious questions all night. 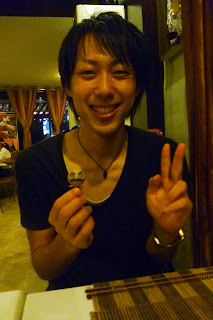 Without further ado, please help me welcome a good couchsurfer - Norihito from Japan. Clap clap clap! What made you travel? To meet people in other countries. It's important to know the characteristics and personality of the people. They reflect the culture of a country. What's a world without traveling? Very scary and dreadful. If people stop traveling, then they won't understand each other especially in foreign countries. What do you like and dislike about Cebu? Like - People are kind, very hospitable, always laughing (most Japanese do not have that character). Dislike - Sometimes traffic is dangerous. I'm scared to walk on sidewalks. Some sidewalks are scary; it doesn't feel safe especially at night. How do you find Couchsurfing? Very good. It brings a lot of good experience. If it wasn't for CS, I wouldn't meet other people. My view of the world expands. Without CS there's no difference staying in Japan or Cebu. Each place is really unique. I hope you learned something from this brief interview. I absolutely had fun and learned something from my first interview session. I'm hoping to add more interviews in the future. Hopefully, with meet-ups with couchsurfers and exchanges with unique people, the interview portion will be a staple in this blog. Explore the backstreets of the city and discover pots of gold. 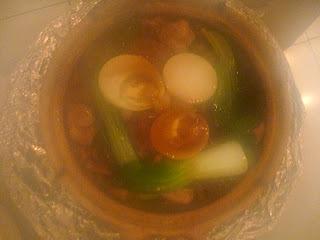 In this case, we discovered a pot of clay: One Claypot House. 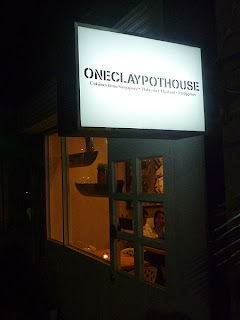 One Claypot House is a tiny restaurant that can accommodate about twenty people. You can't throw your eighteenth birthday bash here unless you want to feel like it's rush hour on the subway. 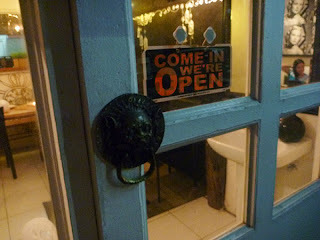 And if you feel like going to the loo, you have to hold it in or go next door, for this House lacks a toilet. Parking space is also nonexistent so leave your car at home. Other than that, this is an intimate little cube of a place. There's less than a dozen items on the menu which spares me the headache of having to choose from so many delicious sounding offerings. 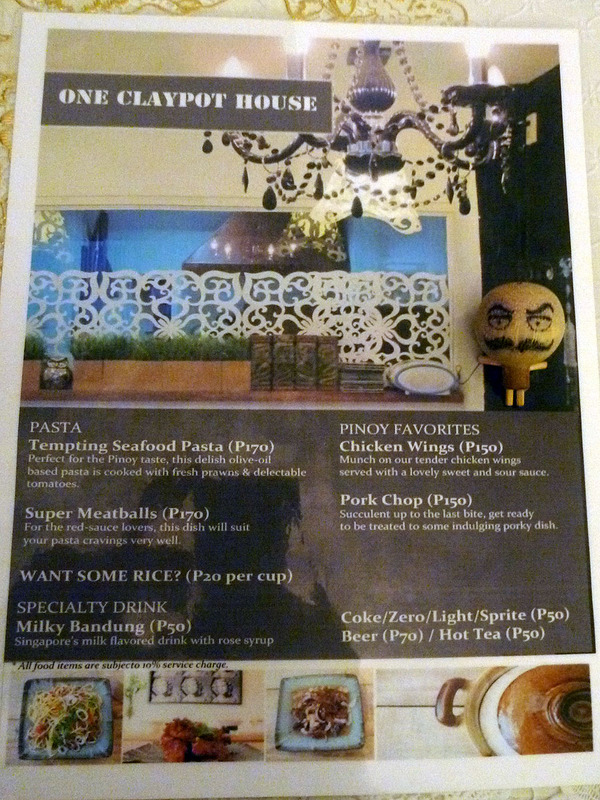 We chose the first three things on the menu: Lah-lah-lah claypot, Sawasdee noodle salad, and prawn paste soup. 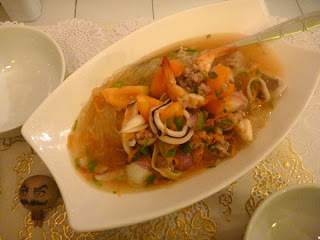 The Sawasdee noodle salad is cold noodles with veggies, shrimps, and squid. 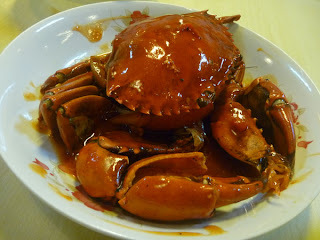 It is spicy and a bit sour. I prefer my noodles hot but this is an exception. Delicious! 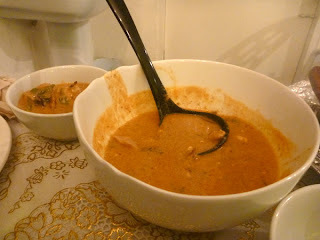 The prawn paste soup has chicken and prawn, and is a bit spicy. My tongue was expecting it to be like tom yum goong (my favorite) so I was disappointed. It was nothing like it. Yes, blame it on my expectations. 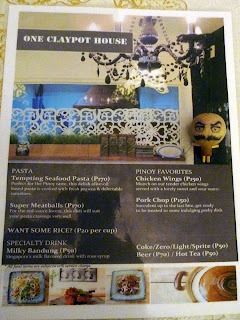 Of course we had to have the Lah-lah-lah claypot. 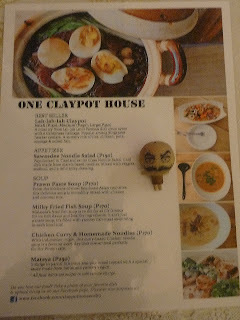 We were in One Claypot House after all. (Is it called One Claypot House because they only offer one claypot dish?) This one I especially liked. 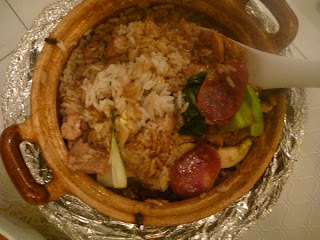 It has rice with chicken, pork, egg, and chinese sausage. Server says it's good for one. I say it's good for me and my date. 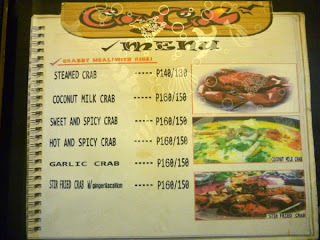 Crazy for crabs, we headed to Gaisano Country Mall to chow on some crabs at a restaurant on the ground floor called... Crazy Crab! Though they offer many other fares, without blinking an eye, we ordered crabs (and took a photo of only the menu page for crabs). The first price is with rice, the second one without. Do not make me compare, I love both! It took us an hour to clean our plate but we wanted more!! 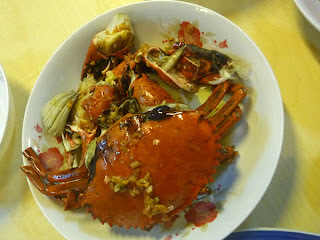 I could have licked the shells of all its yummy sweet and spicy and garlicky goodness!